Though national brands such as Budweiser and Miller overtook local beer production in the late 20th century, the resurgence of local craft brewing in the 2000s led to the opening of nearly two dozen breweries throughout West Virginia, including award-winning companies such as Stumptown Ales, Morgantown Brewing Company, and Greenbrier Valley Brewing Company. Stumptown Ales is a Davis brewery that has been named as West Virginia’s 2017 Brewery of the Year by Brilliant Stream. The brewery was opened by Cindy and Jon Robeson in 2015 and is named for the state’s history of timbering. Its tap room is a year-round favorite for the region’s local and tourist skiers, hikers, and bikers, offering flagship brews on tap such as the company’s Easy Blonde Ale, Cave Dweller Pale Ale, Holy Citra Double IPA, Lefty Lucy American Ale, and Over the Tip-Top Breakfast Stout. Four types of wines are also available, along with a small plates menu. Visitors are also welcome to bring in their own food or order delivery from a number of area restaurants. Greenbrier Valley Brewing Company was the vision of friends and business partners David Kucera and Wil Laska, who released their first flagship beers under the company name in September of 2014. Today, the brewery distributes cans across the state and offers pints and to-go growler sales at its Maxwelton tap room and brewhouse. The company’s brews have received a vast array of regional and national awards, including its year-round Festivale Kolsch, Son of Zona Witbier, Zona’s Revenge Wheat Ale, Wild Trail Pale Ale, and Devil Anse IPA. 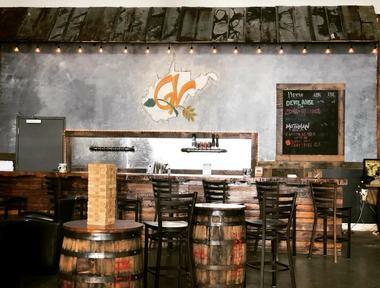 Its tap room is open Fridays, Saturdays, and Sundays, showcasing decor constructed from salvaged bourbon barrels and pallets recycled from Smooth Ambler Spirits. Special events include a family-friendly First Saturday concert series, which offers live music performances, indoor games, and food trucks. 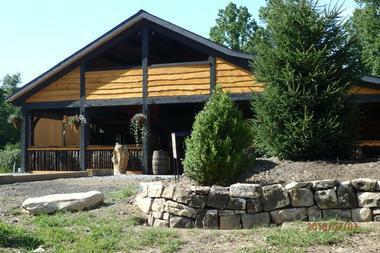 Dobra Zupas’ name is an homage to the last name of its Slovenian owners, the Zupanick family. The full phrase roughly translates as good soup in Slovene, a reference to the restaurant and brewery’s commitment to creating simple gourmet dishes and beer pairings at affordable prices. Globally-influenced menu options change seasonally and include dishes such as Mediterranean pit wraps, fried green tomato BLT sandwiches, and crab risotto. 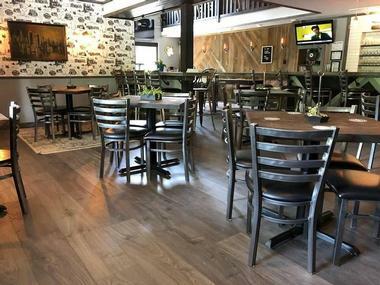 As Beckley’s only craft microbrewery, the restaurant also produces a number of craft ales, including its Bad Orb Hefe, Rammer Jammer IPA, O’Irish Red Ale, and Schwarz Shot Lager. 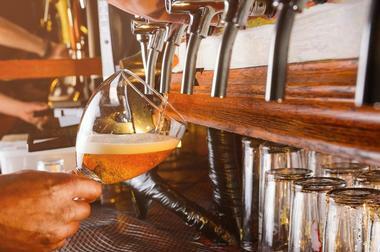 Craft beers from other local and national microbreweries are also available on tap, along with an extensive wine and cocktail menu. 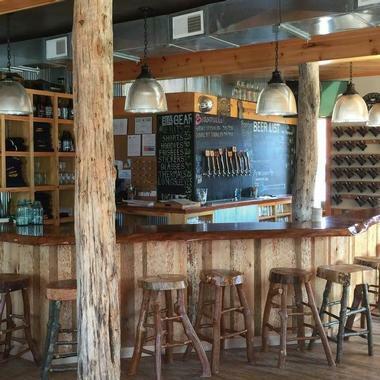 Big Timber Brewing Company is located in Elkins and was opened in 2014, quickly becoming a local craft beer favorite for 16-ounce tallboy can offerings, which are available in limited distribution throughout the state. The brewery offers six year-round beer offerings, including its signature blonde ale, porter, IPA, and pale ale varieties and its Double Pit IPA and Logger Lager Pilsner. Seasonal specialty brews include the brewery’s Wild and Wonderful West Virginia Wet Hop, Frost Notch Winter Warmer, Sluice Dry Stout, and Hatchet Session IPA. Its tap room is open Tuesdays through Sundays and offers taps, growler fills, and to-go sales, along with a variety of special events and live musical performances. Bridge Brew Works is located near in Fayetteville near the beautiful, expansive Gauley River National Recreation Area, which showcases West Virginia landmark New River Gorge. The brewery strives to maintain its small, local roots and offer high-quality craft beers, which are available on bottle and draft throughout the state. 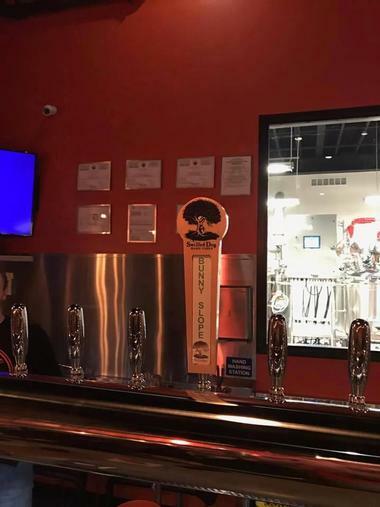 Its tap room facility offers flights, pints, and to-go growler sales of its top brews, including its Hellbender Black IPA, Mountain Momma Pale Ale, Long Point Lager, and Moxxee Coffee Stout, a collaboration with Charleston’s Moxxee Coffee. Beers are available for tasting Tuesdays through Saturdays throughout the afternoon and evening hours. 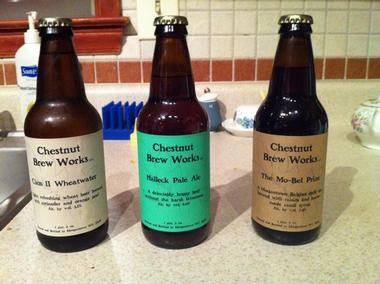 Chestnut Brew Works, LLC was opened to the public in 2013 in Morgantown by head brewer and owner Bill Rittenour and has become one of the city’s favorite social gathering spots, named in honor of the state’s chestnut tree foresting industry, a vital component of its economy. Its tap room facility is open to the public Wednesdays through Saturdays, offering pints and to-go growler sales of its popular brews, including its flagship Halleck Pale Ale, Class II Wheatwater, Nate’s Nut Brown Ale, South Park Porter, and Your Best Hoption Imperial IPA. The brewery has long been dedicated to principles of environmental sustainability, donating all of its spent grain to local farmers for livestock feed. Morgantown Brewing Co. is owned and operated by Chris DeFazio and Cody Cheesebrough, who purchased the brewery from founder Art Gallagher in 2018. 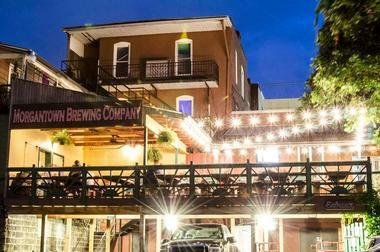 The brewery is a rebranding of the former West Virginia Brewing Company, the state’s oldest brewpub, in operation since 1992. 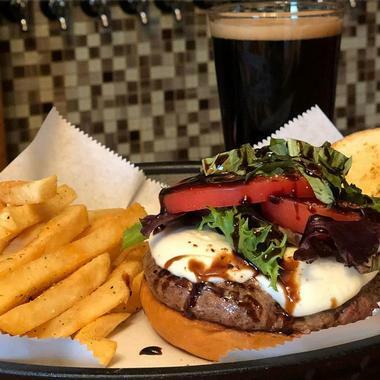 A full menu of American gastropub fare is served at the brewpub seven days a week for lunch, dinner, and late night service, featuring fare such as craft burgers and sandwiches. Flagship brews include the company’s Brookside Blonde Belgian Saison, Gucci Bueno Hazy Session IPA, Zack Morgan East Coast IPA, Bergsteiger Hefeweizen, and Coal City American Stout. The brewpub hosts a variety of special events throughout the year, including an annual Oktoberfest and a Mountaineer Brewfest event. 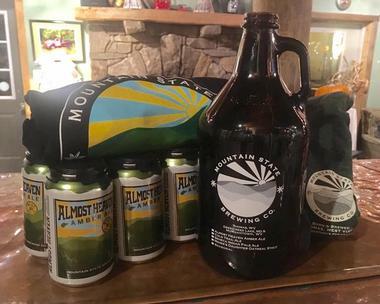 © Mountain State Brewing Co.
Mountain State Brewing Co. was founded in 2005 by brothers and homebrewers Willie Lehmann and Brian Arnett and has since grown to become of the state’s top distributing craft breweries. The brewery operates three tap rooms today in Thomas, Morgantown, and Deep Creek Lake, Maryland and distributes throughout the mid-Atlantic region. Year-round brews distributed by the company include its Cold Trail Blonde Ale, Almost Heaven Amber Ale, Seneca IPA, and Miner’s Daughter Stout. At the Deep Creek and Morgantown tap rooms, full-service restaurant menus are available, focusing on artisan wood-fired flatbreads. The Thomas brew house also features a music hall presenting a full schedule of live concerts and public special events, including the company’s annual Brew Skies Festival. North End Tavern and Brewery is West Virginia’s oldest craft brewery, brewing ales in house at its tavern facility in 1997. The Parkersburg tavern dates back to 1899, the state’s oldest continuously-operating restaurant and the 122nd oldest bar in the United States. All beers are brewed with entirely natural ingredients and use no preservatives in their recipes. 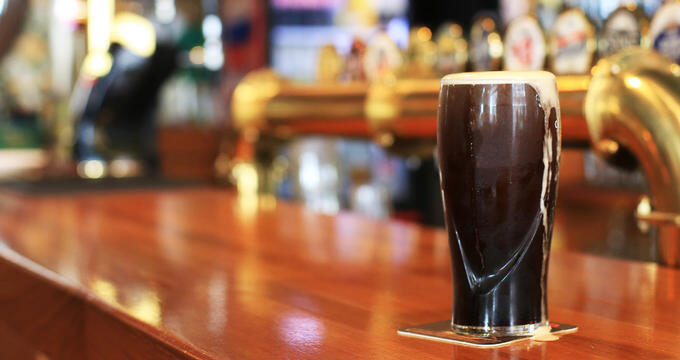 Up to half a dozen brews are tapped at any given time, including the brewery’s award-winning flagship Roedy’s Red Amber Ale. 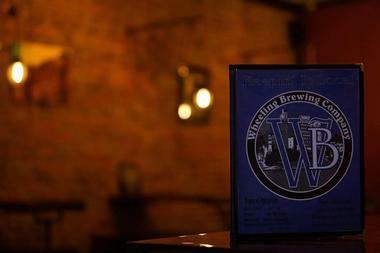 Other craft brews include the tavern’s 5-Way IPA, Dawk’s Porter, Northern Light, West Virginia Wheat, and Berry Wheat. A full tavern menu highlights German-American fare, along with specialties such as the tavern’s famous NET Burger. Parkersburg Brewing Co. is a resurrection of the Hebrank and Rapp Brewery, which opened in 1864 and operated under the Parkersburg name through 1912 and the beginning of Prohibition. Today’s reboot of the brewery is operated by Dan Curtis and Justin Logue and has been relocated to Parkersburg’s Market Street, as the original brewery facility was demolished in 2004. Year-round brews offered by the company include its unique From Ash and Ember, a Cascadian ale with floral, citrus, and earthen hops that pays tribute to the brewery’s symbolic rise from the ashes. Other ales include the company’s Citrus Tsunami Grapefruit IPA, Palooka Pale Ale, Cell Block 304 Brown Ale, and On the Lam Oatmeal Stout. A full bar menu is served at the brewery’s tap room, including shareable bar appetizers and a full menu of craft paninis. 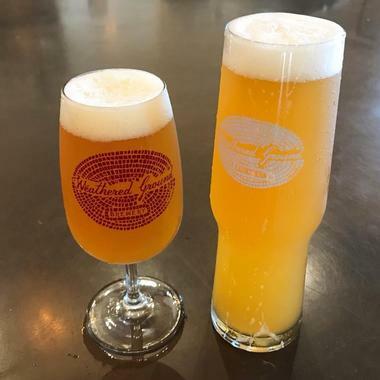 Screech Owl Brewing was opened by Crista and Roger Johnson in 2015 and aims to brew classic unfiltered and unpasteurized farmhouse ales using the finest hops, malts, and barley possible, including many locally-sourced ingredients. It offers a variety of flagship brews, including its Bold Blonde Ale, Threshing Floor Wheat, Wild and Wonderful Strawberry Ale, Hoo’s Your Daddy IPA, and Muddy Creek Ale. Seasonal brews also include its Buckwheat Honey Porter, brewed in honor of Preston County’s annual Buckwheat Festival. 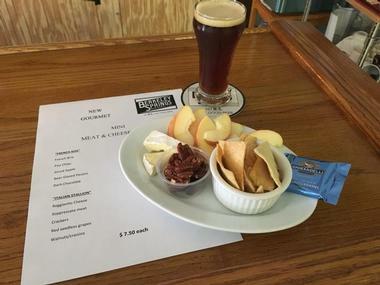 In 2018, the brewery expanded its operations to include the Spent Grain Cafe counter-service restaurant, which offers beer-baked breads, pizza rolls, and pretzels, along with a variety of bar appetizers and seasonal dishes. 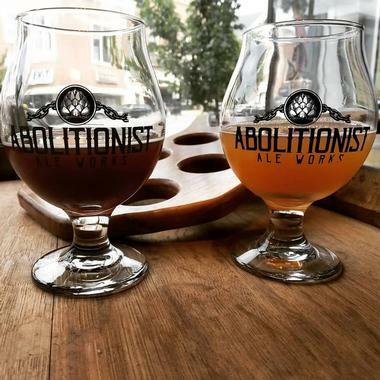 Abolitionist Ale Works is a Charles Town brewery that pays tribute to the region’s long history of insurrectionists, which dates back to famous slave revolts during the American Civil War. The brewery strives to challenge the status quo of the craft beer industry with unique, flavorful ales that abolish the mundane. 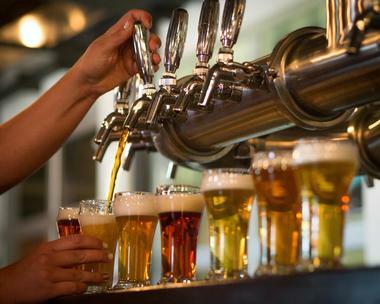 Brews on tap at its tap room include its Alpha Mayle IPA, Wild Wit Wedding, Strawberry Lavender Sour, Treason Brown Ale, and Pale the Funky Hombre tequila-barrel-aged farmhouse ale. Guest taps are also available, along with a variety of bar appetizers and pub fare entrees such as personal pizzas and burgers. Live music performances are presented periodically as part of the brewery’s Abolitionist Live Fridays series. © Berkeley Springs Brewing Co.
Berkeley Springs Brewing Co. promises a “no B.S., just good beer” philosophy at its Berkeley Springs tap room, located near Charles Town and the Cacapon Mountain region. Its recently-opened brewpub serves a variety of its craft ales on tap, along with unique gastropub fare, including craft sandwiches and beer-infused brownies. Flagship brews include the brewery’s Cacapon Kolsch, American Amber Ale, Berkeley Brown, Warm Springs Pale Ale, and Stonewall IPA, while seasonal variants include its Mountain Man Marzen, Barrel-Aged Old Oak Stout, and unique Apple Butter Ale, brewed in celebration of the region’s annual Apple Butter Festival. Housemade non-alcoholic alcoholic sodas and kombuchas are also tapped periodically. Short Story Brewing is a literary-themed brewery that was opened in 2017 by Abby and Mike Kopischke and Aaron Rote, three homebrewers and literature enthusiasts. The unique brewery offers beers with literary-themed names, along with beer flights served to tap room customers in repurposed library card catalog drawers. Beers available at the brewery’s tap room include its Forward IPA, My Friends Call Me Red Amber Ale, Broad Shoulders Dry Stout, Ready Steady Go Pale Ale, and Working Title Imperial IPA. 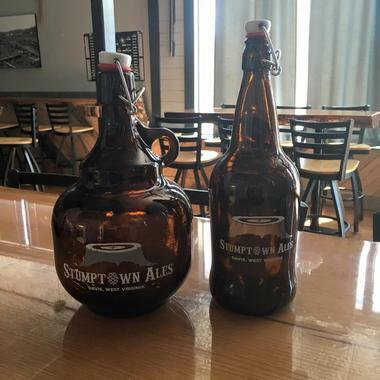 Its tap room is open seven days a week, offering pints, growler fills, and light bar snacks. Weathered Ground Brewery was named as Brilliant Stream’s Best New Brewery in 2017, opened by Aryn and Sam Fonda. The small-batch farmhouse-style brewery offers a tap room in Ghent that is open to the public Wednesdays through Saturdays, offering a seasonal outdoor patio and 10 beers on tap at all times. Brews include the company’s Rad Roots Farmhouse Ale, Allegheny Morning Oat Amber Ale, Ada Imperial Stout, Hand-Me-Downs Wild Ale, and Haggard New England-style IPA. Wine, coffee, and non-alcoholic beverages are also tapped, and seasonal small plates are available for beer pairing. Live music performances are offered on the weekends, along with outdoor activities such as corn hole. Wheeling Brewing Company was founded in 2014 by Chad and Angela Hill, Dave Cornett, and Jimmy Schulte and strives to revitalize Wheeling’s downtown commerce and craft brewery industry. All of the brewery’s beers are named for references to local figures and places, such as its McColloch’s Wheat Ale, Panhandle Pale Ale, Moon Dog IPA, Nail City Porter, and Route 40 American Red Ale. A selection of wine pours are also offered at the brewery’s tap room, including locally-produced rosés and port wines. A full bar menu serves dishes such as bar appetizers, create-your-own pizzas and pastas, and craft sandwiches and burgers. Public special events include Poses and Pints yoga events and live music performances from regional and national artists. Morgantown Brewing Co., Photo: Morgantown Brewing Co.
Mountain State Brewing Co., Photo: Mountain State Brewing Co.
Parkersburg Brewing Co., Photo: Parkersburg Brewing Co.
Berkeley Springs Brewing Co., Photo: Berkeley Springs Brewing Co.